Get an Early Start on Your College Education with Dual Enrollment. 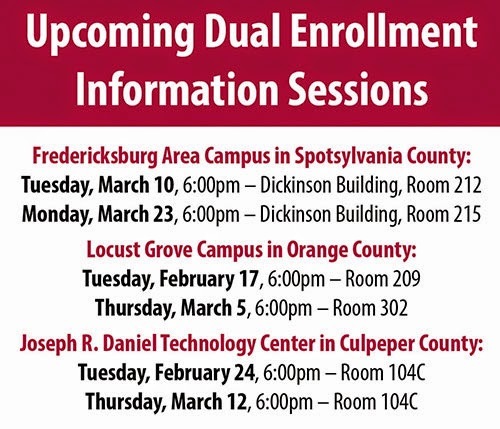 Through Dual Enrollment courses, students gain exposure to college academics, learn from instructors with credentials to teach at the college level, and have access to GCC Resources that facilitate student success. Students earn college credit (most of which transfer to 4 year-colleges and universities) while fulfilling high school graduation requirements! We're so close! 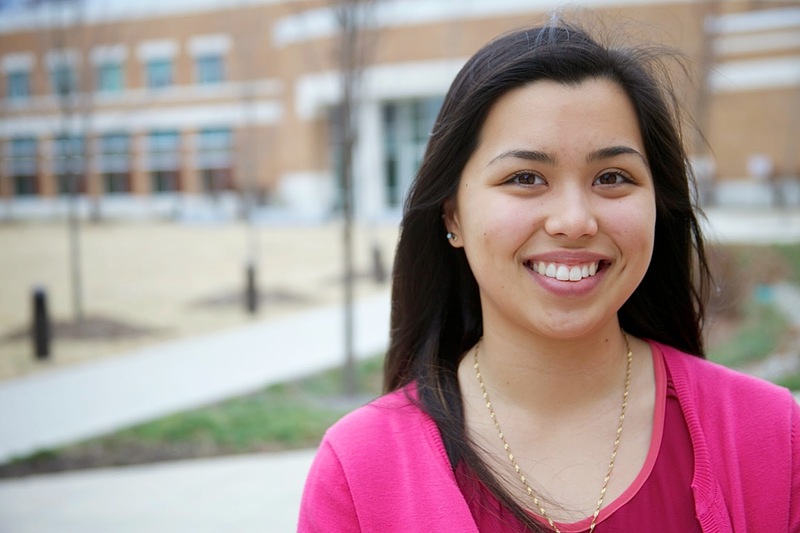 Help Germanna win big! Vote daily. 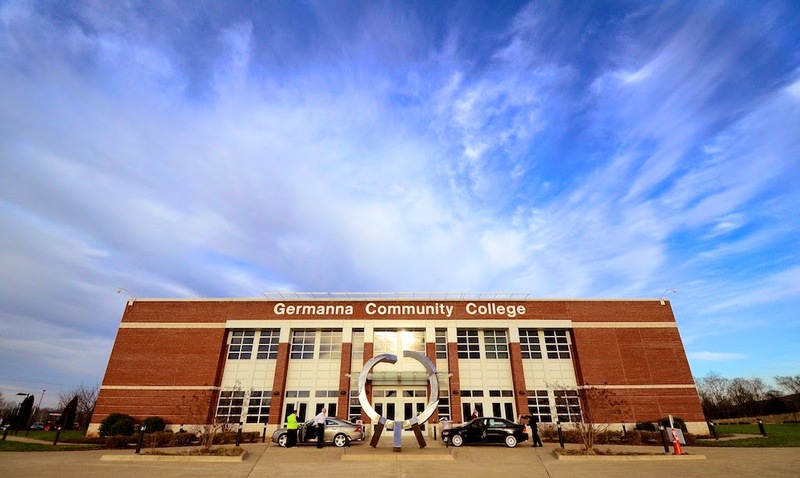 Germanna Community College is competing against colleges across America in a Stanley Security contest for the $100,000 grand prize in the second tier, for schools with 8,000 to 19,000 students. Germanna moved up to third in the voting in its category Thursday night, Jan. 29. Prize money may be used for consultation, products or services from Stanley Security. Grant funds would provide computer software and equipment to be used for video surveillance and monitoring, mass notification and emergency communications, and other critical law enforcement activities, according to Germanna Campus Police Chief Craig Branch. Voting is limited to one per person per day. Voting is open until Feb. 13, with winners to be announced on March 3. Supporters may return to www.stanleysaferschools.com to vote every day. To vote Via TEXT: Type "germanna" to 334455. To vote Via TWITTER: Tweet using both #STANLEYSecurity and #germanna. You can vote once per day per twitter handle. Your Twitter account must be public for the vote to count. ReplyCollege students across the United States have been targeted to participate in work-from-home scams. Students have been receiving e-mails to their school accounts recruiting them for payroll and/or human resource positions with fictitious companies. The “position” simply requires the student to provide his/her bank account number to receive a deposit and then transfer a portion of the funds to another bank account. Unbeknownst to the student, the other account is involved in the scam that the student has now helped perpetrate. The funds the student receives and is directed elsewhere have been stolen by cyber criminals. Participating in the scam is a crime and could lead to the student’s bank account being closed due to fraudulent activity or federal charges. The student could be arrested and prosecuted in federal court. A criminal record will stay with the student for the rest of his/her life and will have to be divulged on future job applications, which could prevent the student from beomg hired. 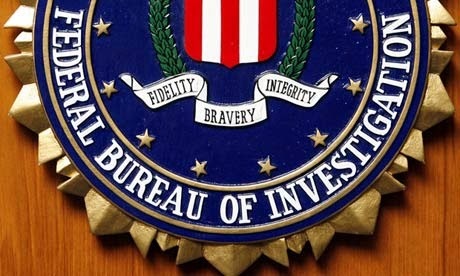 If you have been a victim of this scam, you may file a complaint with the FBI’s Internet Crime Complaint Center at www.ic3.gov . Please reference this PSA number in your complaint. The IC3 produced a PSA in May 2014 titled “Cyber-related Scams Targeting Universities, Employees, and Students” that mentioned this scam. The PSA can be viewed at.http://www.ic3.gov/media/2014/140505.aspx. 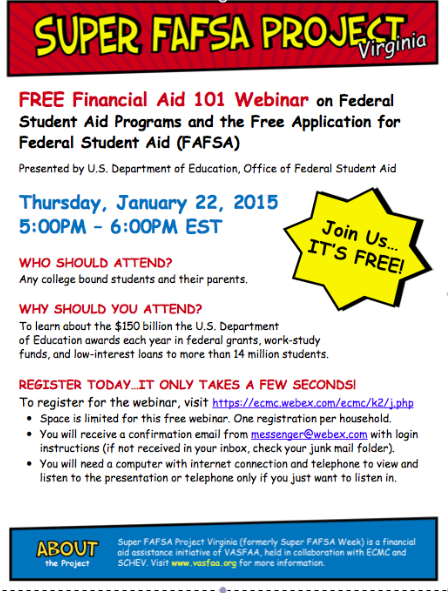 presented by U.S. Department of Education's Office of Federal Student Aid from 5 p.m. to 6 p.m. on Thursday, Jan. 22. Don’t leave $150 billion on the table. It’s time to fill out your Free Application for Federal Student Aid (FAFSA). The 2015-2016 FAFSA became available Jan. 1. For college-bound students, parents and counselors, filling out a FAFSA is the path to access $150 billion in grants, loans and work-study funds. For more information, email financialaid@germanna.edu . Seven ways to squeeze more college aid from the FAFSA.